A new approach to wellness with vibroacoustic sound. Years of scientific research has shown that specific low frequency sound pulsations and beautiful brainwave entraining music have powerful therapeutic effects on our health and well-being. The practical applications of sound being used in treatments have been present in cultures throughout our history. Early cultures such as the Aborigines, a tribal group from Australia, have used sound to heal the ill. They would use a yidaki, a musical instrument in which blown air would create very low vibrations. The BioAcoustic Mat™ employs a powerful low frequency sound generator that delivers a deep acoustic massage for joints and tissues. The music pieces on the BioAcoustic Mat™ apply the low frequencies of 30-68 Hz to massage large muscles and the higher 52-88 Hz level for smaller muscles. Dr. Lee Bartel, the world's foremost authority on vibroacoustic therapy's research has shown scientifically developed sounds will relax and renew your body naturally. The high-fidelity upper speakers add another dimension of sound therapy to the BioAcoustic Mat™. The beautiful music on these upper speakers have been designed to provide a calming sense of well-being. Drawing on years of experience, Dr. Bartel has created tracks that get you ready for sleep by stimulating deep sleep delta brainwaves, helps you relax by stimulating alpha brainwaves, or helps you get energized and solve problems by stimulating your theta brainwaves. Feel the pulses of the BioAcoustic Mat's™ healing energy. Vibroacoustic relaxation is not just for the brain. It also provides deep physical cellular stimulation to the skin, muscles, and joints. Research has shown that relaxing music helps reduce stress. However, with the BioAcoustic Mat™, you not only hear the music but feel it as well. Like a massage, the vibrations from the BioAcoustic Mat™ relaxes you in two ways. First, powerful low frequency speakers and transducers are used to help deliver a deep acoustic cellular massage. The lower frequencies are used to massage large muscles, and the higher frequencies for smaller muscles. Secondly, these sounds affect brain activity to help contribute to a state of mental well-being. Professors and researchers have collaborated to create beautiful soothing music which is designed to help you reach a calming sense of tranquility. The music is composed and designed in a way to complement the frequencies emitted by the speakers. The vibrations stimulate the nerves in the spine, brain stem, and limbic system that drives emotional response, and activates the auditory nerves that connect to your muscle tissue, and the low frequency bass causes the muscle tissue to be at ease. If you ever found yourself tapping your feet to the beat of a song, you have the basic idea of entrainment. It is a physics principle, where one rhythmic system falls in line with another. It is our body's way of going with the flow. From a physics standpoint, less energy is required when one system falls in line with another. 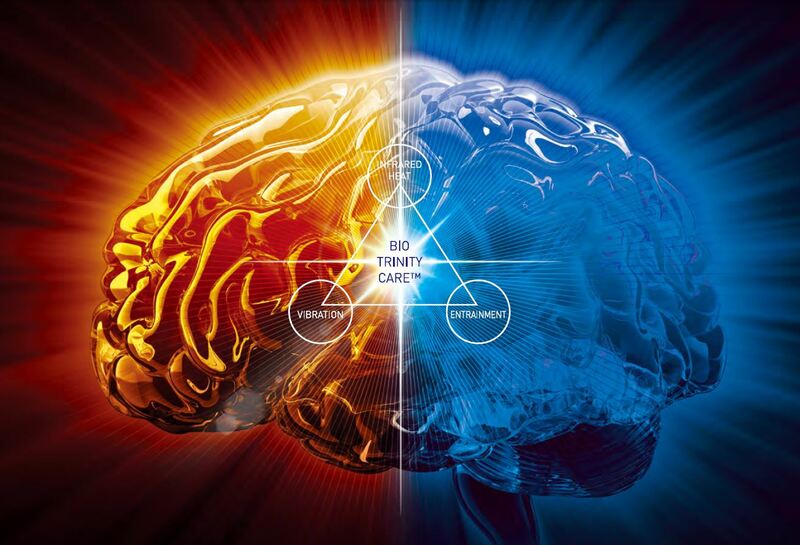 The human brain is a complex system and is made up of an immense neural network which sends and receives signals. It shapes our entire reality. The pulses are rhythmic in nature and can be temporarily subject to entrainment. The BioAcoustic Mat's™ music is embedded with specific frequencies that coax our mind into different therapeutic states. The carefully constructed tracks stimulate healthy neural activity in the brain by controlling the number of sounds the ear hears per second and by playing a slightly different pitch in each ear. This results in our mind syncing with the rhythm of our body becoming more relaxed or energized. Dr. Bartel is a Professor Emeritus of Music and former Associate Dean for research at the University of Toronto's Faculty of Music, as well as Director of Music and Health Research Collaboratory. Dr. Bartel has special interest in applications of music in health conditions of aging and rehabilitation. He is well known for his research and design of music for health. His primary research interest is currently in Rhythmic Sensory Stimulation (RSS) with applications for several types of pain. Within the Canadian Music Education Research Centre, Dr. Bartel is the Coordinator of the Music Therapy and Health Special Research Interest Group. He has also served on the Accreditation Review Board for the Canadian Association of Music Therapy, has been involved in noteworthy studies with the Centre for Health Promotion, University of Toronto, and has supervised doctoral and post-doctoral research at Bloorview Kid's Rehab, Lyndhurst Hospital, and Baycrest Hospital. Drawing upon his many years of experience, Dr. Bartel designed the internationally best-selling Music for Your Health series from the Solitude's label, as well as Somerset Entertainment's SonicAid series. His Gold and Platinum album work has been nominated for several Juno Awards. Today, Dr. Bartel's contributions include 16 books, multiple academic papers and publications. 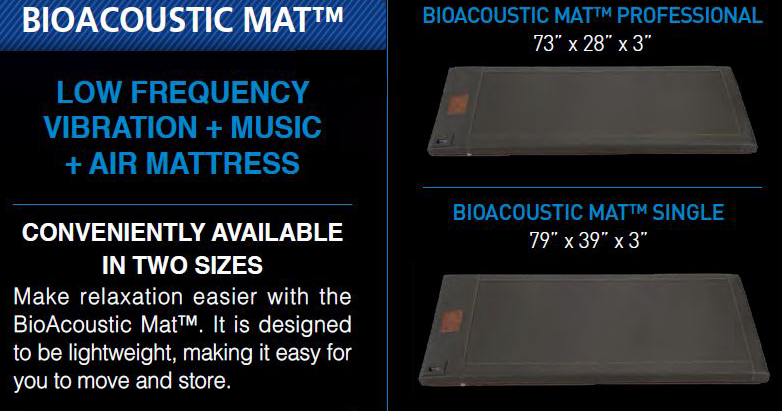 Use the BioAcoustic Mat™ in conjunction with the Biomat­® for optimal performance.